Opened in 2012, Disney’s Art of Animation Resort hotel is the ultimate in family fun. 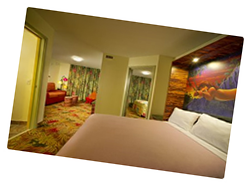 This Value Resort features over one thousand family suites, specially designed to accommodate up to six guests, as well as standard guestrooms accommodating four. The Resort hotel draws its inspiration from four classic Disney Animated films: The Lion King, The Little Mermaid and Disney·Pixar’s Finding Nemo and Cars. Cool off in a in the largest themed pool on Walt Disney World® property.